When I was a kid, I used to be very excited whenever I bought a copy of the newspaper. As superficial as it might sound, the first thing I would always do would be to flip the pages till I got to the comic section and see what my favourite dog had been up to. You see, I was quite faithful to this comic character for a long time and I dare say I learnt to draw it quite well too. See? Not too bad, right? 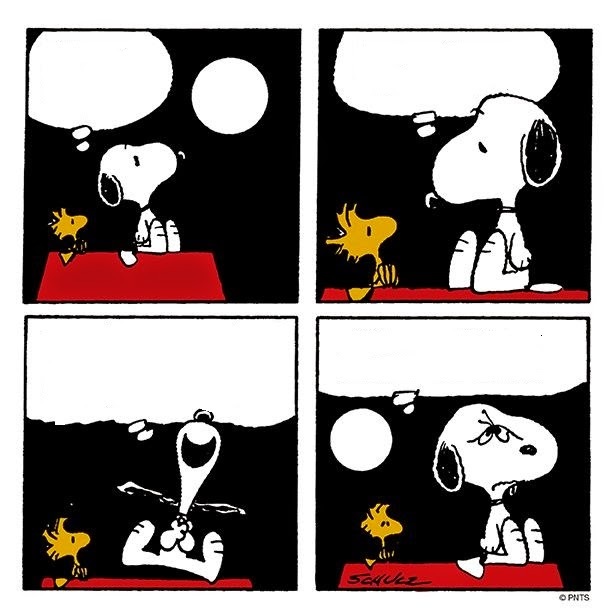 Yup, I adored Snoopy because he just seemed like the most huggable, tame and endearing dog in the world. Moving along the years, my memory of this comic character slowly faded and when the kids came along, it wasn't a surprise that I got overwhelmed by the likes of Dora, Barney and all the Disney Princesses. Instead of just letting the kids tell me what they like, I guess it's high time to introduce to them one of my favourite characters as a kid. 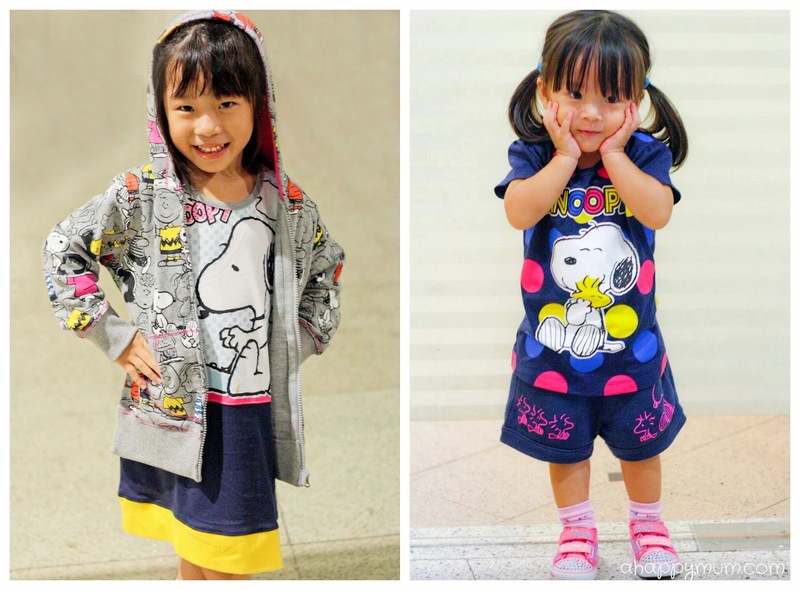 Thanks to the newly launched Peanuts collection by Bossini, I can't think of a better way to let the kids get in touch with Snoopy and his friends other than wearing them! Prior to this, every one of us already owns a handful of Bossini apparel at home because we just love how casual yet cheerful it looks, how easy it is to mix and match and how value for money it is. 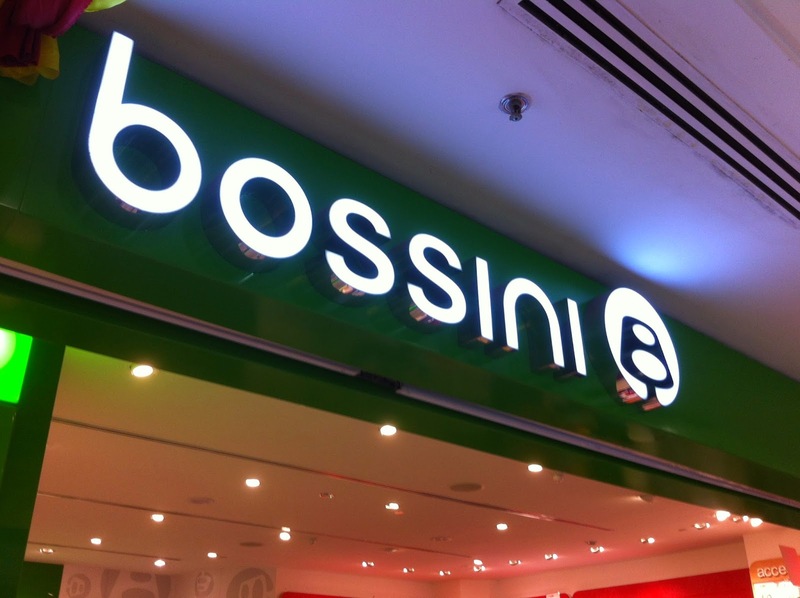 Moreover, "be happy" is Bossini's brand value and that can't be more apt for a family who believes in a positive attitude and living life to its fullest, right? 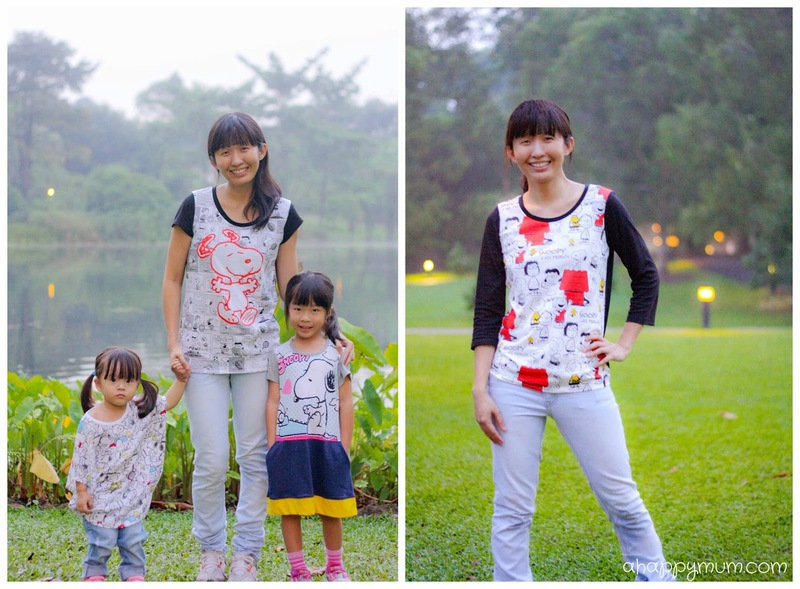 When it comes to apparel, I'm more of the T-shirt and jeans, rather than blouse and skirt, kind of mum. I guess that is because it is much easier to move around and when we are not attending functions or events, I prefer to dress the kids in leisure wear too. The main priority is to make sure everyone is as comfortable as can be. 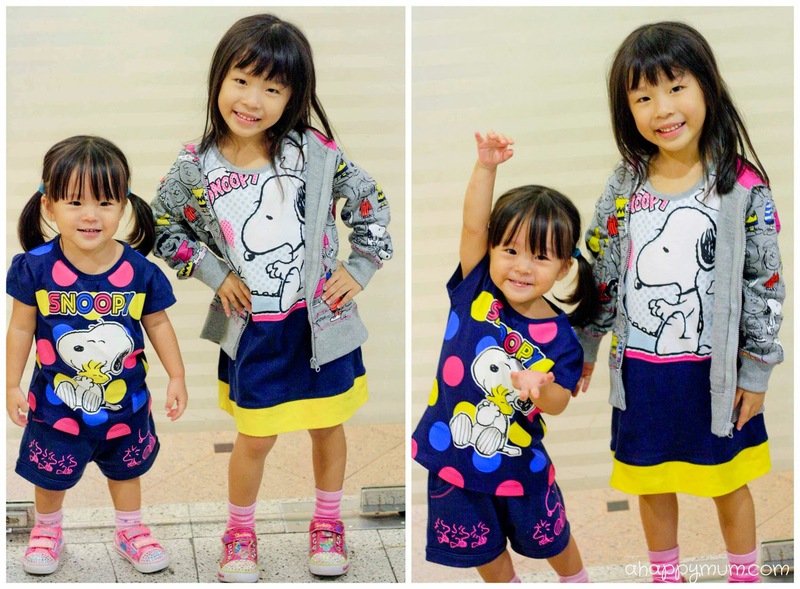 So, it was not hard for us to fall in love with the Peanuts collection because other than getting reacquainted with my favourite comic character, I have to say that the clothes were easy to wear, soft on the skin and the colourful, striking and exuberant designs that spoke of zest got our thumbs up too. Of course, another plus point is that they have designs and sizes that cater to the needs of the entire family! 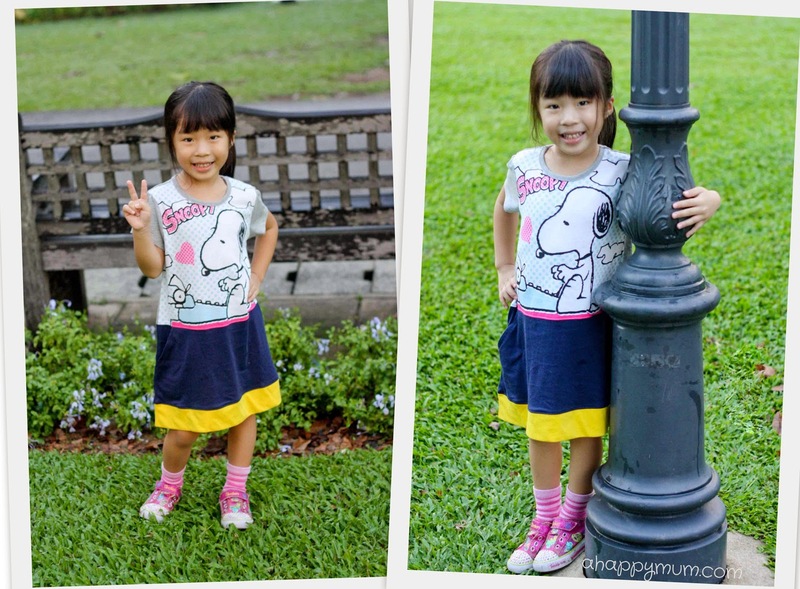 Angel's favourite piece from the collection is the knit dress which has a clear picture of Snoopy at the front coupled with a dark blue skirt bottom accentuated by a bright yellow edge. The design made it look really chic on her and I love how she decided to match it with the grey graphic hooded jacket. 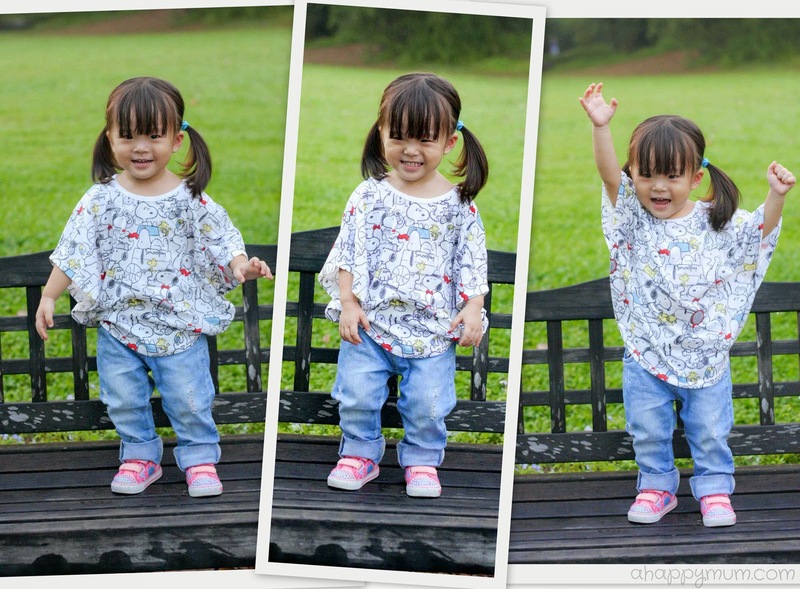 As for Ariel, though she can't really articulate which is her personal favourite for now, it was not hard to tell that she felt the most at ease when dressed in the polka dotted Snoopy graphic tee and the matching dark blue shorts. 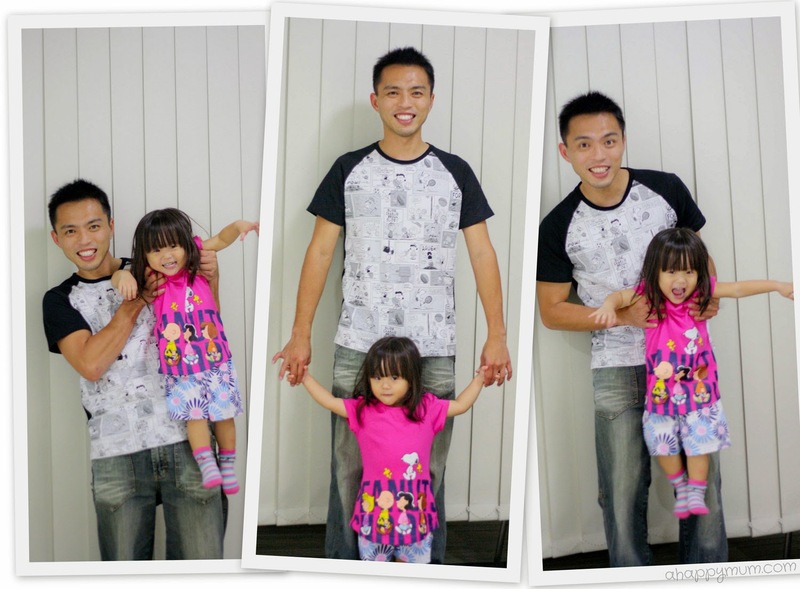 For the hubby and I, we were a little hesitant about how we would look in these bold graphic tees with cartoon motifs and comic strips because they didn't really seem like our style. After we tried them on, I think the one thing it managed to accomplish was making us look, and feel, younger. I guess it's nice to go for a change once in a while, don't you agree? 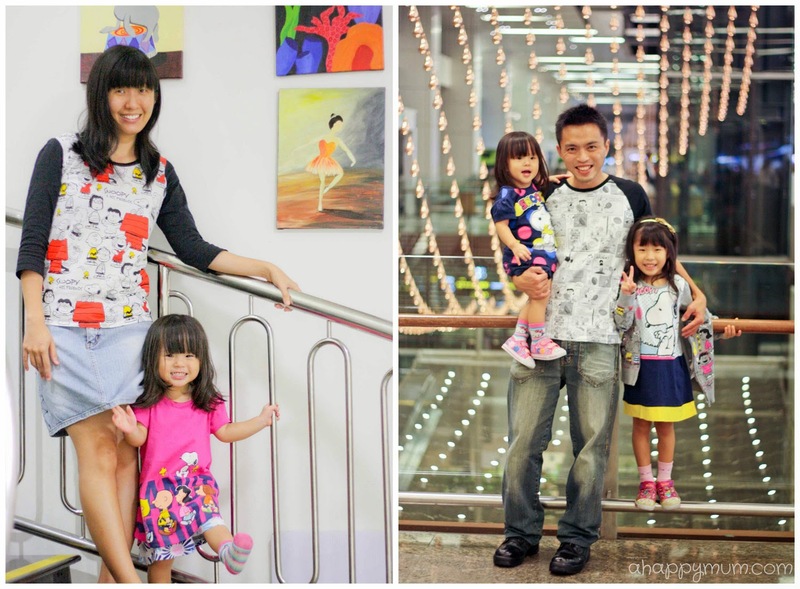 Not a family to eschew matching wear, I think the vibrant Peanuts collection helps to brighten up the day and when we come together as one, we are reminded of how joy can be found in the little things in life and that it really isn't that hard to "be happy". Exciting news for all Snoopy and Bossini fans! Receive a free Single Size Snoopy Bedsheet set with every $150 spent or free Queen Size Bedsheet set with every $200 spent. These are made of 100% combed cotton, soft and breathable fabric. If you or your child loves decorating with stamps, you must collect this Snoopy Stamps Set that features the Peanuts characters Snoopy, Lucy, Woodstock and Charlie Brown. Free with $250 spent. All while stocks last, so hurry! On 22 and 23 of November (Sat & Sun), come celebrate the launch of the Peanuts collection with Bossini at the Takashimaya outlet. 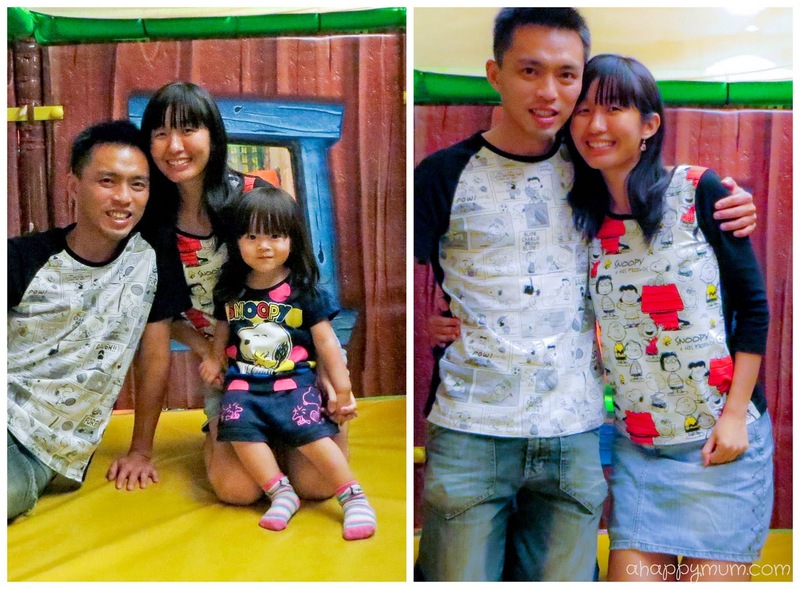 Besides the galore of Snoopy apparels and collectibles, you can also have fun at the Snoopy themed photo-booth and enjoy complimentary sweet treats like candy floss and popcorn. This is open to public from 1-9pm only. From 20 Nov to 5 Dec, complete the Peanuts comic strip by reposting it on your Instagram account, fill in the empty speech bubbles in your caption and tag Bossini’s instagram account @bossinisg. To qualify, you must also follow Bossini’s Instagram account. The three most creative answers will be chosen and rewarded with $100 worth of Bossini shopping vouchers from Bossini, a Snoopy Stamps Set and a Snoopy Single Bedding Set! 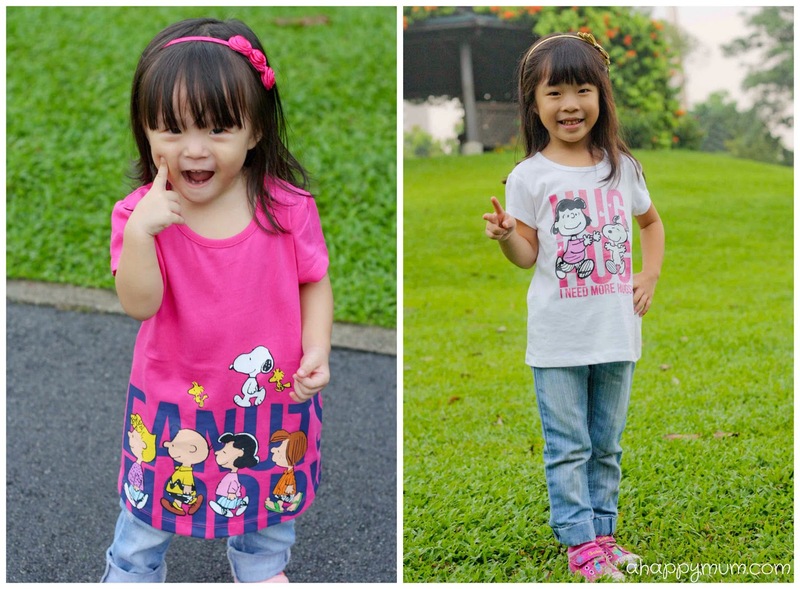 For more details on the Peanuts collection by Bossini, visit www.bossinibehappy.sg. Disclosure: This is a sponsored conversation between Bossini and A Happy Mum. All opinions are my own. So super cute! You have a lot of adorable family photos on this post. Thanks Christina! 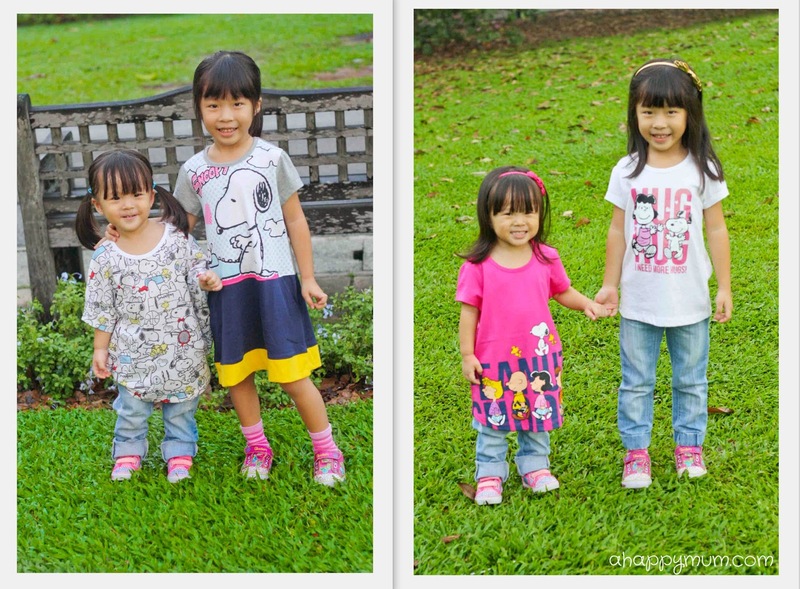 =) I think these outfits are super cute too and am glad the girls are loving them!